Should a newcomer to Phuket buy or rent their property? It’s a common question asked by new arrivals to the island. Of course, like most decisions we face in life, there are pros and cons to either option, and the right answer depends on the individual circumstances. So what advice is there to give someone facing the buy or rent dilemma? Firstly, it depends on what type of person you are. If you are young, adventurous, and can’t sit still for five minutes, then it would likely be a foolhardy move to buy a property in a country when there is a more than a fair likelihood that you might “up and leave” within a relatively short period of time. A property purchase is a long-term commitment, and unless you are speculating with the intention of “flipping” the property, it should be something you plan to own at least for a few years. A rental property, on the other hand, can be dropped without a second thought. You can rent for whatever period you like: one to two months, six months or even one year. Generally speaking, the longer your rental contract the better price you can get. But your only commitment is the expiration date on your rental agreement, making you as free as a bird to take flight whenever the fancy takes you. Some people love the flexibility they get with renting, more importantly they like the lack of responsibility. When you rent, you don’t have the burden of fixing things when they go wrong. Instead, you just make a call to the landlord or the property agent, and the onus – as well as the expense – is on them. Overall, there is also less of a financial commitment to renting, although there will always be an argument favouring the long-term financial benefits of buying. For short term rentals, even up to one year, the financial commitment is paltry compared with the outlay for a property purchase. This is especially true because foreigners living in Thailand are unlikely to obtain a loan facility. This means all purchases are usually made in full, in cash. For renters, on top of any requested security deposit, which is normally fully refundable, the only financial outlay is the rent itself plus utilities. Over the short term, purely from a financial perspective, renting makes the most sense, especially if you are unsure whether Phuket will be a short chapter in your life, or it is where you intend to write your life story. Should I Buy in Phuket? As time passes, the benefits of renting diminish, and buying starts to look like the most sensible option. Some people refer to rental payments as “dead money” because once that monthly rental money has been handed over, it will never be seen again. With buying, you expect to see that money again, in one form or another. It may come in the form of future rental income, or from the eventual sale of your property. Property is always one of the most emotional purchases you will make in your lifetime. If you buy a property to live in, you’ll spend most of your waking and sleeping hours in it, so it really needs to feel like home. You really can’t put a price on sentiment and emotion, although they are two of the key determining factors in your choice of property. Homeowners have complete autonomy. Whether that home is a condominium or a landscaped pool villa, you truly are the king of your castle. Want to bang some nails into the wall to hang a picture or paint a wall or tear one out or plant some trees or dig them up? It’s all yours to do with as you please, and you don’t need to ask permission first. Home ownership gives you satisfaction – it makes you feel self-sufficient, independent, and every change you make adds a bit more of your personality, and fills you with a sense of pleasure and gratification. But buying a house or villa, especially a pool villa, also means the responsibility for ongoing upkeep, maintenance and repairs are entirely down to you. This inevitably involves an additional financial outlay, and it is not always cheap. 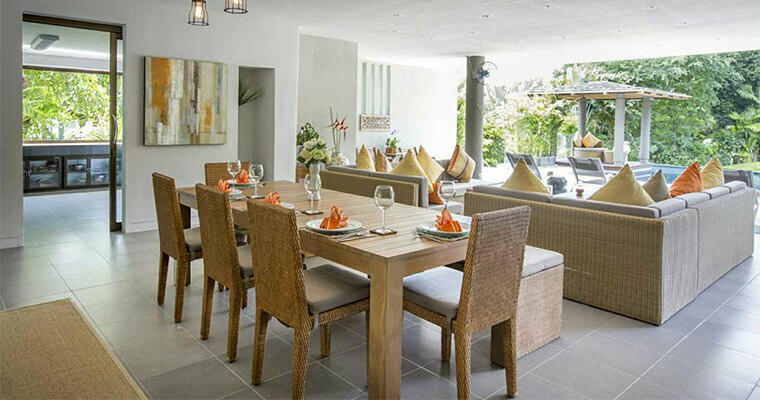 While diligent maintenance will help you head off the more expensive repairs, after a few years some things inevitably will start to fall apart, especially in Phuket’s tropical climate. The elements are always a factor, from the scorching sun between November and April to the humidity and persistent bombardment of rain during the “green season”. Roof tiles, drainage systems, air conditioning systems – all of these need to be replaced eventually, and costs of running a home in the tropics should never be underestimated. If you are retired and enjoy taking on the role of “handy man”, some of those larger repairs can be pushed forward years into the future. But if you are working full time (or you own the property as an investment for rental), you will need to pay someone full time to take care of the property for you, which is another running cost which comes with home ownership. Some people are put off from buying a property in Phuket because of Thailand’s land ownership laws. When choosing between owning and renting, these individuals would rather enter into a long-term rental of their ideal property (e.g. a pool villa) than try to circumnavigate the law. While it is possible to buy a condominium on a freehold basis in Thailand, giving you a permanent title, freehold land ownership by a foreigner is generally not permitted. There are, however, other options available to you (even for landed property), but you must follow the law to the letter. If a house is what your heart really desires, it is also possible to purchase property on a leasehold basis. This gives you all the benefits of property ownership, while shielding you from future rental price increases, which are a fact of life for life-long renters. Leaseholds can be extended, meaning you can live in your Phuket dream house more or less permanently. Also, any foreigner married to a Thai spouse, has the option of purchasing a house on a freehold basis through their spouse’s name. There are boxes to tick, but the house and land can be owned outright, just not by the foreign spouse. We’ve addressed the cost of home maintenance already, but a buying home also incurs other up-front fees, which you must account for. The main expenditure is obviously the purchase price. But there are also lawyer’s fees, as well as local government transfer fees (normally around 2% of the purchase price). However, the latter are typically shared with the developer on new builds. If you decide that a leasehold is the best way to go, you will also have legal costs, as well as a leasehold registration fee of 1%. Be aware that this is usually split between the two parties involved, so be sure that this split is included in the agreement before you sign. Condominium owners also have to pay upfront into a sinking fund. In addition to the ongoing maintenance or service fees (for gardening and upkeep), the sinking fund is like an emergency fund for major common area repairs, such as the swimming pools or the elevators in your building. The most important advice to anyone faced with the choice of buying or renting is to consider their own motivations, situation and finances. It is also imperative to have a thorough understanding of Thai property law (or to be advised by a trustworthy lawyer who has). It is common for someone to start by renting when they first arrive on the island, while they decide if Phuket is the right place for them. If Phuket ticks all the boxes and you feel it is worthy of a long-term commitment, then you might want to take the next step. Once you are sure that your Phuket love affair is not a passing fancy, then the transition from renting to buying can take place. Finally, unless you intend own your home until the day you die, at some stage you will have to sell it. This also comes with additional costs. There are new developments opening in Phuket virtually every month, offering plenty of options to foreigners looking to buy in Phuket. Your property must stand out! To ensure that it does, you must have the foresight from day one to keep the property well-maintained. By keeping the interior attractive and stylish, you will guarantee that when you do come to sell, your property is still attractive to sophisticated buyers. You must then take the time to market your property correctly – to ensure that it is being viewed both virtually (online) and physically by prospective buyers visiting Phuket. If you fail to make your home as attractive to future buyers as it was to you when you first chose it, then it could become a millstone around your neck, remaining unsold for months or even years after it goes on the market.